Fantasy Flight Games gives us a preview of the upcoming new book for Rogue Trader: The Soul Reaver. 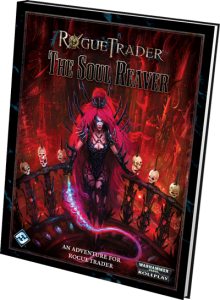 Fantasy Flight Games is pleased to announce the upcoming release of The Soul Reaver, an adventure in three parts for Rogue Trader! This epic campaign is a chance for daring Explorers to look deep into the twisted heart of Dark Eldar society in the Koronus Expanse, and pull the greatest heist of their careers.